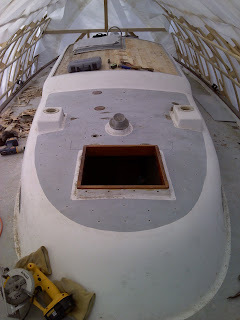 With the aft cabin top removal behind me (literally), I focused my attention on the forward cabin top for this weekend. I didn't have a ton of time to work this weekend so I didn't really finish what I had started, but now that it is light a bit later, I hope to finish up during the week. 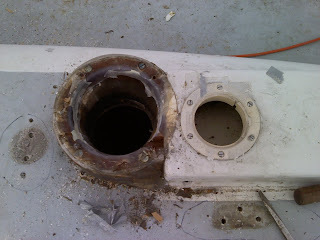 I was really surprised at the condition of the core when I opened up the aft cabin top last weekend and expected it to be much worse than it turned out to be. I really didn't need to pull the entire top, I could have just removed the starboard side and would have been fine. Oh well, lesson learned... So with that in mind I decided to take a slightly different approach on the forward cabin top. But first, I needed to tackle the one remaining piece of deck 'hardware' on the boat: the stovepipe through the deck thingy. I had no idea how it was attached and from what I could tell, it was a big chunk of rounded mahogany bolted and glued to the deck and one of the dorade vents. On the top there was a very rusty stovepipe fitting that has a little 'moat' around it that when filled with water is intended to keep the surrounding deck from catching fire. Kind of a neat idea, but I never had a stove to hook up to it, so I don't know if it really did work. In any event, the original installation has some problems and it has to go. The first issue is that it is a rusty, leaky mess. The second is that instead of going straight up through the deck, it elbows into the head and then goes up through the deck there. In theory it is a nice idea to move some warmth into the head and forward areas of the cabin, but I can imagine getting some horrific burns while attempting to maneuver in the head. It would not be pretty. So, armed with a prybar, hammer and drill I set out to pull the assembly off. I had to drill out the moat thingy because the screws were just rusty lumps. It was bedded with something god awful sticky but was able to pry it off with a large screwdriver and hammer once the screws were drilled out. 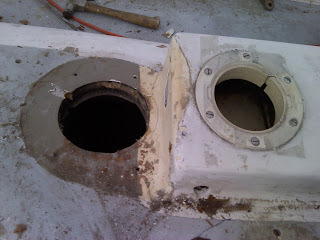 Once that was off, the screws that affixed the mahogany piece to the deck were revealed. They backed out easily and then was able to pry the mahogany off in several pieces. The sticky stuff holding it down was so tenacious that it ripped out an inch or so chunk of the dorade's gel coat and exposed down to the underlying cloth layup. 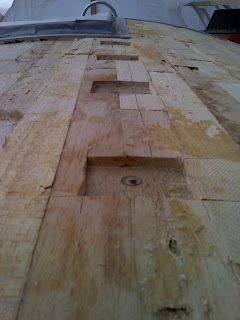 Once everything was off, the original non-skid deck pattern was exposed (and in good shape). Another thing that was quickly apparent was that the original installer did little (if anything) to protect the core. It was all exposed directly and quite wet. With that mess wrapped up, I focused back on the decks. As I said before, I was going to take a different approach to this section. I didn't think there were as many issues on this section (not noticeably spongy), so I didn't assume that the entire core was junk and just rip it out. Here I took a 1/4" bit and drilled a patchwork of holes in a semi-planned pattern where each hole was roughly 5 or 6 inches apart. 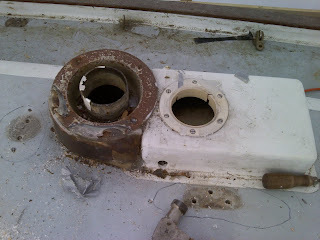 Not surprisingly, the problems only turned up around areas where there had been deck fittings. So I marked off those areas to be cut out later this week and will leave the rest of the holes to be refilled and faired (not sure if these should be beveled; will have to find out best approach for that). One thing that was surprising was that there was no core underneath the mast step or anywhere along the beam that runs the width of the cabin top where the mast step lives. It is solid glass and looks to be about 10 inches wide. That was good news, I didn't want to have to get in there and mess with that if I didn't have to. I think I saw that one of Tim Lackey's projects (http://www.lackeysailing.com) dealt with a bad core issue underneath the mast step. 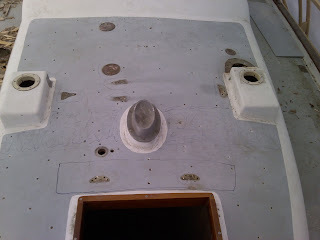 The pictures below show the bad areas marked along with the solid glass area underneath the mast step. Hopefully I'll get to cutting those bad areas out this week. 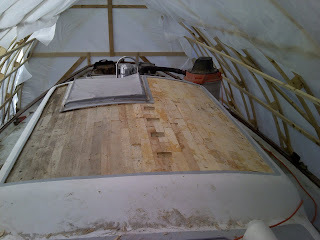 After bracing up the main cabin last week I was able to remove the rest of the top without worrying about falling through or distorting the curve of the cabintop. The big surprise was that the entire port side was in great shape... perfect, so I really didn't need to remove it. 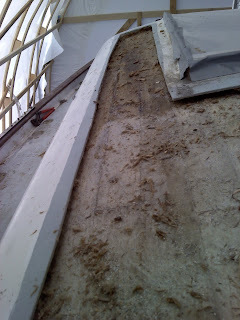 Yet the starboard side was a wet rotten mess and I dug it all out (and under the remaining deck skin). It was really difficult to remove the top skin and now that I have I can see that somebody had taken the time to fill all the through deck screw holes with epoxy and then retapped for the screws and bolts (See second picture below). The same can't be said for the starboard side and is exactly why that area is rotten. 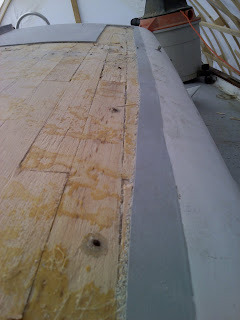 Because the port section of core is perfectly good and pulling it up would be a real pain, I think I am going to leave it in place but enlarge the areas of the through deck screws to make room for a plug of solid glass layup (See first picture below). Armed with the new Dremel Multimax I was able to easily cut out the squares I needed around some of the existing through deck holes. I'll finish up the rest of them this week. I had heard mixed reviews about the Multimax but given that the Fein was completely out of the question (way to costly), I decided to go for it. So far it works great and I haven't had any of the issues that I had read about in some of the reviews online. I hope this won't be a mistake leaving this part of the core in place (I have several opinions for doing either), but I guess I'll find out. I don't think that I will find alot of good core on other areas of the boat, so I don't believe this is a decision I'll have to make very often. Next week I'll be putting more bracing in for the forward cabintop and start beveling the edges of the cuts for tabbing in the new skin when the time comes.